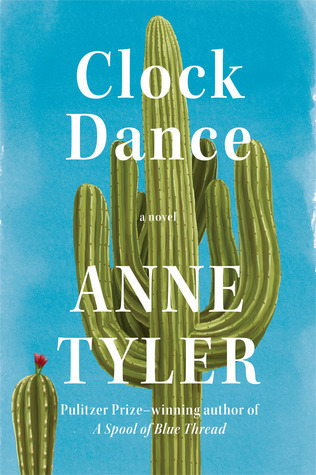 The Writing– Clock Dance is the first book I have read from Anne Tyler, and it will not be my last. I have already downloaded a few of her backlist books on audiobook. She is a Pulitzer Prize winning novelist and the reasons why are very evident in Clock Dance. She has a way with words and it is incredible how she can make a seemingly simple story seem so extraordinary. The Characters– Willa and all of the supporting characters are ordinary, everyday people who seem completely real. These are characters that could easily be your neighbour, your friends, your family, etc. I appreciated that Clock Dance is simply the story of one woman’s life. She experiences things that most of us will go through at one point in our lives. I also really liked that Willa is not a twenty-something woman! She has adult children! It was so refreshing to read from the perspective of a woman in a different phase of life. The side characters shined in this story as well! They each had their own personalities and quirks. None of them were perfect, and that just made me love them even more! There were some characters I didn’t like, aka her husband, but they felt authentic. The Story– The plot of Clock Dance is very quiet and I would definitely classify this as a character-driven novel. We follow Willa’s life starting at childhood when she is dealing with an unpredictable mother, then in her twenties when she is dating her husband, then when she is married and something tragic happens. The second half of the novel takes place in the present day and she ends up looking after a little girl under odd circumstances. This leads to her discovering a lot about herself and what she wants and needs in her life. Her past also affects how she acts and thinks in the present day. The Pacing– There were times throughout the novel that I felt the pacing was pretty slow. I thoroughly enjoyed Clock Dance and I am thrilled that I got the chance to read it. I have come to realize that I really connect to quiet stories that follow the lives of one character. I can not wait to read more of Anne Tyler’s novels. I am wondering if anyone has read her books in the past and which ones you would recommend? Thank you to Penguin Random House Canada for sending me a copy of Clock Dance in exchange for an honest review. Oops! I Messed Up Book Tag! Thank you! I really do think you would enjoy this book quite a bit. I still find myself thinking about it which is a sign of a good book! Great review, Kristin! I’ve never read a book by Anne Tyler before, but I’ve heard amazing things about her books. This one seems like something touching and unique and I’m definitely adding it to my TBR. Thank you! I am so happy that I finally read something by her. The way she tells a story really leaves an impression on you. I am so happy you added it to your TBR! Looking forward to this one! I really enjoyed her previous novel (A Spool of Blue Thread) — but I agree, her works are quiet and thoughtful and the pacing can take some getting used to. I am hoping to read A Spool of Thread soon! I am happy that you enjoyed it. I love your posts! Can you tell me how you add the goodreads link for your reviews? I love how it takes you right there… but I can’t seem to figure that out! to it just like you would any image. I hope that makes some sense. Let me know if you have any questions! Wow, yes that does.. thank you! I really like that! I’ll give it a shot!